Omega Oil, billed as a liniment "For What Ails You" including "Corset Pain", was introduced in the 1890's by the Omega Chemical Company founded by Michael Winburn (Jan.1, 1861 - Nov. 13, 1930). Located in 1900 at 41 Park Row, New York City, the firm moved first to 257 B'way, then (in 1902) to 452 Fifth Ave. with a factory at 243 Greenwich St. In 1908 they re-located the offices to 576 Fifth Ave., where Winburn headed an advertising agency. About this time also Michael Winburn founded the Cadum Soap and Products Company of Paris and became active in philanthropic causes in France (there is still a rue Michael Winburn in Courbevoie, France). In 1920 the officers of Omega Chemical were Michael Winburn, pres. ; Charles H. DeFreest, vice-pres. ; Clara E. Jeroleman, sec. ; Henry D. Bloom, treas. Winburn died in 1930 (Click here for image of grave site), and within a few years Omega Chemical moved its operations to the Sunset Park Industrial Area of Brooklyn: 220 36th Street (1934) and 882 3rd Ave. (1938). The firm subsequently moved to Jersey City, New Jersey: 190 Baldwin Ave. (1940) and 257 Cornelian Ave. (1954). In the 1960's Omega Chemical was taken over by Block Drug Co. of Jersey City, who continued to market Omega Oil until around 1983(?). 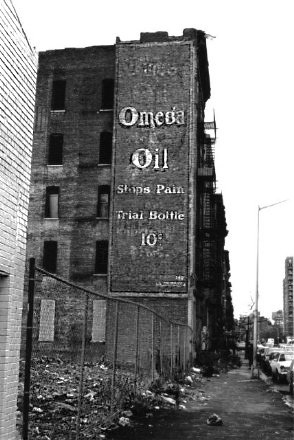 Click here for photo of Omega Oil bottle from the Block Drug era. The ingredients of the time are listed as: Methyl Salicylate, Chloroform 12% (39 minims per fluid ounce), Oleoresin of Capsicum, Histamine Dihydrochloride and Methyl Nicotinate, Isopropyl Alcohol 48% by volume. Many thanks to Kim Maricic (whose grandmother used Omega Oil) for photo of bottle and list of ingredients!